I've looked at boats from both sides now, from big and small, and still, somehow ...wait, who's writing this post - me or Joni Mitchell? Well, still, somehow, I can't make up my mind which I like better - the bigger boat or the little boat. I'm kind of resigned to the bigger boat with its comfy space to sleep down below. Until they extend the ocean to Sacramento, we have a 90-mile drive before we can go sailing. Once we've driven to Berkeley, we usually like staying there for a few days. And it's nice to be able to crash on the boat after a sail without having to worry about a long drive home. Purely by accident, I have also discovered that, with a boat big enough to sleep on, I can drink distilled and fermented spirits after sailing without endangering my fellow motorists, so the bigger boat performs a sort of public service, too. But I had a chance to sail a small boat again a few weeks ago, and rediscovered some of the small boat's virtues. They are many. I've posted before about how my wife has just taken a basic keelboat class. To make best use of the instructor's time, they cram a whole lotta stuff into a three-day class. They really expect students to do most of their learning in the practice sessions after the class. So, I've been going out with my wife in the training boats - Capri 22's. These boats may seem big to a Laser sailor, but they still handle like dinghies. They move OK in just a few knots of breeze, respond pretty quick to a puff, and can be short-tacked through a very narrow channel. But, most importantly, they still give that direct, seat-of-the-pants feedback to the wind and to the helm that is so important when you're learning how a sailboat works. Unlike a Laser, though, they won't leave you swimming if you muck up a jibe. They're great boats for learning the basics of tiller and sheet. 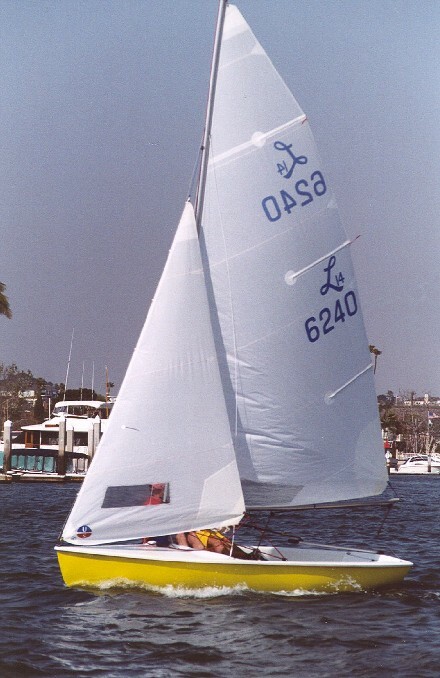 It's too bad those basics seem to be almost left out of the ASA basic keelboat class. Huh? Isn't that what a beginning sailing class is supossed to teach? Well, I've just sat in on my wife's class, and, with all of the jargon and tacking drills and docking practice and man overboard drills and how to use a roller furler and how to read a tide chart and how to fill out the boat checkout forms, they somehow never got to the part where I think most people actually learn how to sail. And that's the part where you just play with the boat - you know, the fun part. 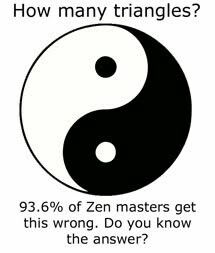 My wife passed the class with flying colors, but seemed overwhelmed by all the stuff she had to memorize. Is learning to sail really about memorizing stuff? I think it's about picking up that instinctive feeling - somewhere between your navel and your noodle - for what to do when the wind fills a sail. It's something like the knack of riding a bicycle, but not quite. The bike always goes whenever you push the pedals, no matter what the wind is doing. To sail, you've got to get your head out of the boat and feel what the wind is doing. And you can't really see the wind. There's no red line drawn on the water - like in the textbooks - to show you which way it's blowing. See how I'm burning up a lot of words here to explain something you just have to feel? That's kinda what the guys who wrote my wife's sailing textbook did. I'm not sure there's any other way to do it when you have to write down and formalize this stuff. So, a few weeks ago, we went out in the little boat to see what we could feel. No drills, no beam reaches, no 45-degree angles to the wind. Just turn until the boat starts going and then turn the other way until it slows down. Pull the sheet in until we find the groove, then ease off until we lose it. We kept the jib furled the whole day. One sail, one tiller, one sheet. My wife started feeling better about the boat right away. She started feeling better about the dumb motor, too. That's because we left it turned off. In the three-day class, they had never once shown how easy it is to sail a small boat up to a dock. We tried that a few times and she was no longer worried about what would happen if we couldn't get the balky outboard to start. For my wife and me there will be more days of feeling things in the little boat. I think that's really what little boats are all about. Feeling too lazy to do anything worthwhile yesterday evening, Tillerwoman and I watched the movie Failure to Launch which was showing on TBS. It stars Sarah Jessica Parker and some guy, and has some sailing scenes. In one scene the guy has to teach Sarah Jessica Parker how to sail. He uses a big boat. It has a wheel. The most important lesson seems to be to hail, "Jibe Ho!" before jibing. In a later scene they are on a big boat with a wheel again. I think it is a different big boat. Sarah Jessica Parker says, "Let's sail to that lighthouse over there," and starts turning the wheel. She forgets to say, "Jibe Ho!" The boat jibes and the boom knocks the guy into the water where he has a sappy scene with a dolphin. I guess that proves your point. I don't think Sarah Jessica Parker and the guy were feeling things in the big boat. That was your point, wasn't it? I checked on Wikipedia (which is never wrong) to see what it says about the movie and it says that Sarah Jessica Parker was committing "blatant violations (of) push-up bra safety." I think I must have missed that part. One expert sailor I know says that we should become better sailors by intensively fiddling with just one sail control at a time... spending hours and days changing one thing only. And one of my classic sayings is "There is no one perfect boat". Some people amend it to, "There is no perfect boat -- except the 'next one' ". I haven't seen that movie, either. But, if the producers cast Sarah Jessica Parker and Matthew McConaughunk, they were probably looking to stir different kinds of feelings than what I was talking about. I looked up that Wikipedia article, though. I noticed that this film (which received poor critical acclaim) managed to make $24.6 million in its first weekend - a weekend I probably spent rooting around in West Marine for a left-handed, semi-gusseted, bronze pump flange. I wonder who really has the last laugh about such cinematic fluff. I also noticed no mention in the review of any push-up bra safety. Sometimes, I think you think about safety too much. Sweet sailboat, but would Terry Bradshaw ever own a boat like that? Let's be serious. And, yes, hollywood just can't make actors look like they know how to sail, no matter how hard they try. Sorry O Docker, my mistake. The safety warning was in the synopsis on the IMDB site about this movie. I think people should always heed safety warnings, but having done further extensive research into Ms. Parker's alleged push-up violations I have discovered that opinions are divided. Some seem to think that implants are to blame. Can you buy those at West Marine? Which aisle are they in? I think they're with the rest of the PFD's. me. I studied that brochure online for weeks while contemplating a couple of Cat 30's in the Annapolis area. Catalina did/does a great job of tempting their prospective customers with pics of casually clad guys and gals sailing effortlessly in the boat. The image I remember is one of a couple sailing with a tiller and cocktails in hand. I really wanted one of those boats. 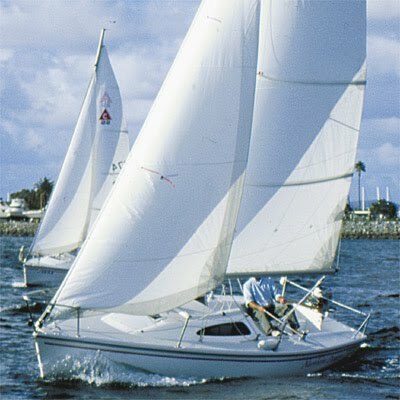 One of the beautiful things about the Etchells is that even though it is more than 30 feet long, it's really a dinghy. I do get the seat-of-the-pants feel for how the boat is sailing. As for Hollywood -- any time there's a movie involving a sailboat (unless it's a heavy-duty drama), there must be at least one scene in which the boom swings over and knocks people down, preferably into the water. Pat is now contemplating a bigger boat that one can take naps upon. Of course, nothing is even remotely certain anyway, but I'm not sure I agree with that direction. A Capri 22 handles like a dinghy????? A Cal 20 is very dinghy like, a Capri...hmmm. Are you sailing out of Martin's? I know that Sac State has a pretty decent sailing school and club. The membership is a bargain too, I think it's around $300 for the family. Membership gives you access to keelboats, cats and Lasers. Maybe I've spent too much time in my fat Cat, Joe. The Sac State program is where I first got to capsize a Laser. It's nice being able to sail in shorts and a tee shirt. If you haven't been there in a while, you wouldn't recognize the place. They've developed it into maybe the best rowing venue on the west coast. I think I was the first one to get checked out in their Holder 20's when they added keelboats in the early 80's. Baydog, Catalina's Frank Butler was a genius at reading his market. He was one of the first to realize that most of his customers would never be crossing oceans but did want a large, comfy space below. 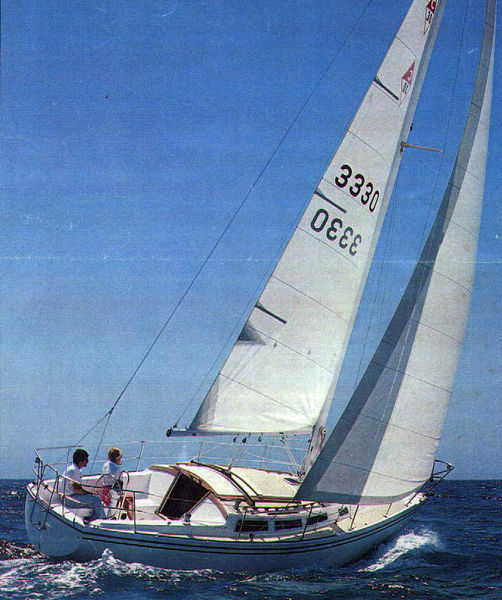 The Catalina 30 may have been the first 'boat show' boat. Despite this, they've turned out to be good boats for SF Bay - they're happy in heavier air and actually sail pretty well in those conditions. Dinghies they ain't, though. Carol Anne, I've always loved the lines on the Etchells. I can't think of a 30 more different than my boat, though. The Etchells weighs less than the the keel on the Catalina, I think. Wait a second, "Etchells is that even though it is more than 30 feet long, it's really a dinghy." An Etchells is a dinghy? I know that I just fell off the turnip truck, but dinghy??? Really???? Why do keelboat owners always have to argue about whose boat handles most like a dinghy? i just cannot get the idea of a personal floatation bra out of my mind. I really would like one. Are they coast guard approved yet? Bowsprite, I'm having a little trouble getting the idea of a personal floatation bra out of my mind, too. I'm sure the Coast Guard is looking at this carefully. I did once, a long time ago, comment about how it's hard for a short but broad broad to find a PFD that fits right. The question I asked was "What kind of Mae West would Mae West wear?" Yes, even though the Etchells is 30'6", the whole boat only weighs 3/4 as much as O Docker's keel. However, the Etchells has almost 60% ballast ratio compared to about 41% on the Catalina and many other boats, so it's quite stiff. "Be the ball, Danny. nananan nunununu..."
I jest, but you're right on the mark.